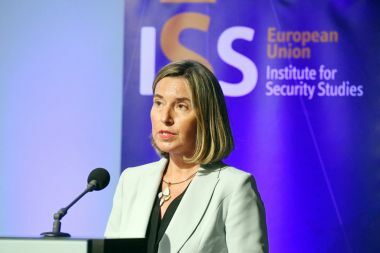 Mogheirni: "We will save the Iran nuclear deal"
BRUSSELS-- European Union (EU) High Representative Federica Mogherini Monday said she will be meeting in Brussels Tuesday Foreign Ministers of Britain, Germany and France to discuss Iran nuclear deal after US President Donald Trump announced withdrawal from the deal last week. Mogherini would be meeting with Boris Johnson, British Foreign Secretary, together with the Foreign Ministers of Germany Heiko Maas and France Jean-Yves Le Drian. "We will work together, to preserve a deal we have achieved together - also with Russia and China - and we will save it together," she said speaking at event organsied by the EU Institute for Security Studies on "The future of EU foreign, security, and defence policy post Brexit." Later, Mohgerini will have a joint meeting with the three EU foreign ministers together with the Iranian Foreign Minister Javad Zarif. She noted that the "British interest and the European interest are still very much the same, and I guess they will continue to be very much the same. "We reacted as one to the Salisbury attack and on Iran, we continue to work on the same side, for exactly the same goal," she added. Mogherini said "a majority of British citizens have decided to leave the Union and we obviously have to respect their decision. "But now, we can and we must work to make sure that our new relationship works in the best possible way under the new conditions that the British citizens have decided to put in place," she added.